Be the first to share your favorite memory, photo or story of Floreca Elene. This memorial page is dedicated for family, friends and future generations to celebrate the life of their loved one. Friends and Relatives are advised of the passing of Mrs. Floreca Elene Norman-George of St. John, USVI and Anegada, BVI. 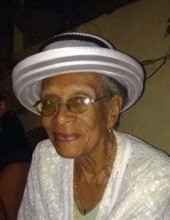 At the age of 91, Elene or Teacher Elene, as she was affectionately known, passed away at her home on Cruz Bay, St. John on Monday, April 1, 2019, while surrounded by her family. Preceded in death by her husband Richard Calvin George and her daughter Janet Cecilia George-Carty, Elene is survived by her children Marcia, Calvin and Myrna George of St. John, 6 grandchildren: Shereada, Calvin Jr., and Nya George of New York, Crystal and Keenan “pye” George of St. John and Suzette Kelly of Virginia, one grandson-in-law Nkrumah Motilewa, 9 great grandchildren and one great great grandchild. She is also survived by many other relatives and friends to include the George, Faulkner, Norman, Wheatley, Varlack, Creque, Potter, Vanterpool and Knight families of the USVI and the BVI. Please forward all tributes to myrna.george@gmail.com by Noon on Tuesday, April 9, 2019. The Funeral Service for the late Floreca George will be held on Saturday, April 13, 2019 at the Nazareth Lutheran Church on St. John, USVI . The viewing will be held from 10:00 a.m. to 11:00 a.m.; The Service begins at 11:00 a.m. with the Interment immediately following at the Cruz Bay Cemetery on St. John, USVI. Once again, you are advised of the passing of Mrs. Floreca Elene Norman-George of St. John, USVI and Anegada, BVI. To plant a tree in memory of Floreca Elene Norman` George, please visit our Tribute Store. "Email Address" would like to share the life celebration of Floreca Elene Norman` George. Click on the "link" to go to share a favorite memory or leave a condolence message for the family.